Consumer confidence in Tallahassee REALTORS appears to be on the rise, with greater than 80% of all home sales in Leon County being reported in the Tallahassee MLS. Homes sold by Tallahassee REALTORS have been rising for three years now, as many of the people who entered real estate sales during the boom of the housing market have decided to move on to a new career. The real estate graph above shows that per-person productivity had fallen 65% from 2002 to 2009, but the last three years has seen a rise of 37%. REMINDER: The 52nd monthly edition of the Tallahassee Real Estate Newsletter was sent to subscribers this morning. If you would like to join the 3,000 subscribers who have this delivered, for FREE, to their email inbox, just click on the image to the left to subscribe. 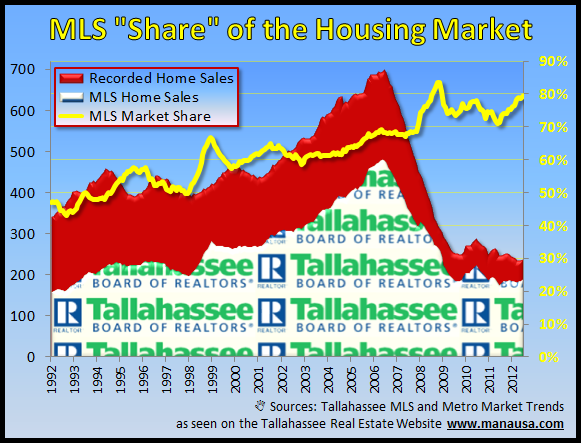 The graph below shows the total market of recorded home sales (red) and all sales reported in the Tallahassee Board of REALTORS® Multiple Listing Service. The difference between the two data sets would be homes sold by owner, homes sold by some builders, and even some homes sold by REALTORS® that did not need to be marketed in the MLS. That means more than 80% of all homes sold over the past year involved at least one REALTOR®. The gold line in the graph above measures the ratio between REALTOR® sales and all recorded home sales, and the number has been rising since the early 1990s. It is interesting to note that the crash of the market in 2007 caused a major jump in this index, thus we might expect to see it soften in a few years when the market begins to return. The best way to get your home sold is to employ a Progressive Internet Home Selling Plan. Selling a home is no longer a set-it-and-forget-it task, it takes daily activity to get a home sold. If you would like to schedule a demonstration of our home selling plan, just drop me a note and I will show you how to bring the full weight of the internet to your home sale and how we will get Tallahassee REALTORS bringing buyers right away.